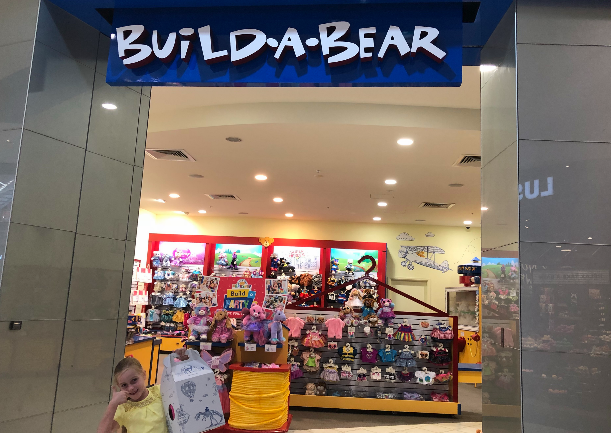 You may have seen a Build A Bear shop and you’ve certainly heard all about it, but if you’ve never been inside and experienced what it’s all about – the tribe is missing out! We visited our local Build A Bear and I can confirm it’s more than just creating another teddy for the kids. Here’s what we love about it. Build A Bear‘s are customisable in almost every way you can think of! The first step to creating your new cuddly friend is choosing your bear or toy. There is a whole wall full of fluffy toys waiting to be adopted. They can pick a teddy bear in loads of different styles or colours, there is even a bear that is low allergen and has no detachable parts such as eyes to cause choking hazards. Or you can go for something a little different like a pony, dog, cat, unicorn, a Paw Patrol dog or even a Minion! What happens when you go in store? This is what makes Build A Bear such an experience for the tribe. 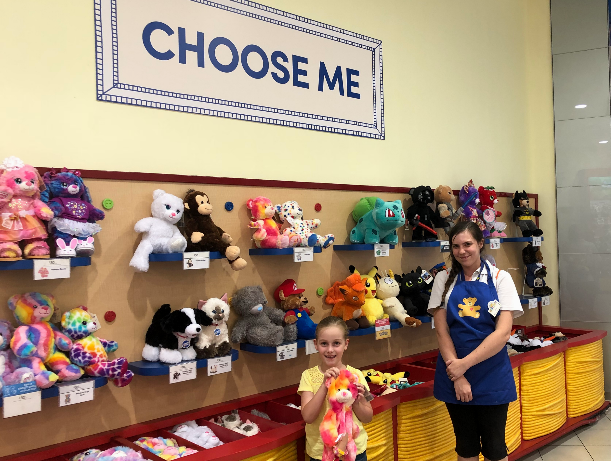 The friendly staff take your kids through the entire process which is a hands on one making a trip to Build A Bear an event rather than just a teddy bear shopping trip. You pick your bear skin, then you can move onto the Hear Me station where you can choose to insert a sound box into your toy. You can mark an occassion with a Happy Birthday or an I Love You, or if it’s a licensed character like Skye from Paw Patrol, there is a special voice box for her! You can also record personal messages onto a voice recorder which is what can make a bear a really special gift for someone you love. You can also insert a scent into your toy which we did! We had fun sniffing all the delicious flavours before landing on Bubble Gum. How do you make the bears? 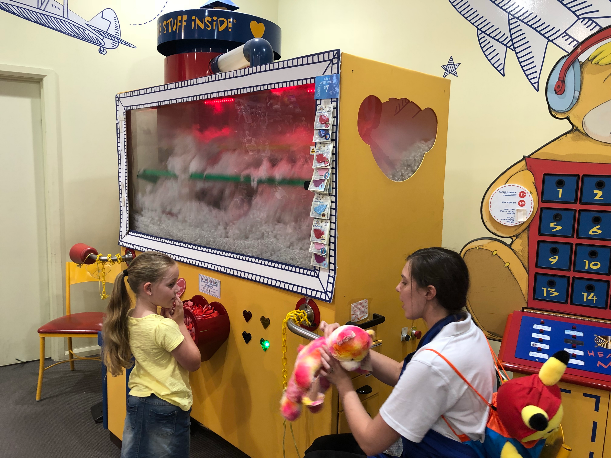 There is an awesome stuffing station where the kids are asked to push all of the love hearts to give their bear all the most important features including love and friendship. Then they can put their foot on the pedal and their bear starts to fill up with fluff before their eyes. They have a little hug test to see if they like how cuddly their bear is and get the cuddle factor just right. Then the gorgeous heart ceremony has to happen before your bear can be stitched up. You can choose a small fabric heart or a little battery operated heart with a heart beat to give your teddy a pulse. 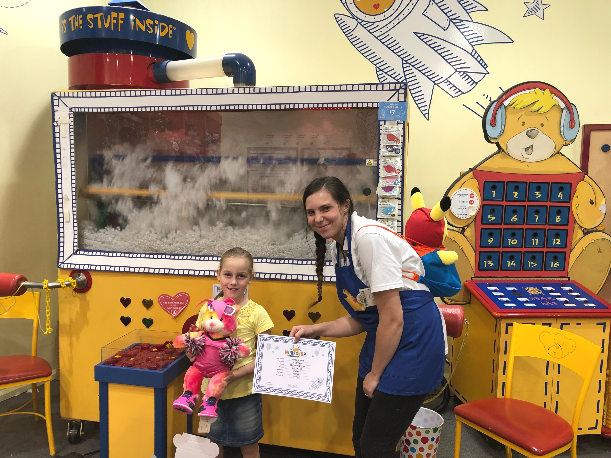 Then – just like a secret handshake, the staff at Build A Bear do a beautiful and fun heart ceremony which for us involved some shaking, some jumping and a wish and a kiss before putting our heart into our bear. What about dressing the bear? 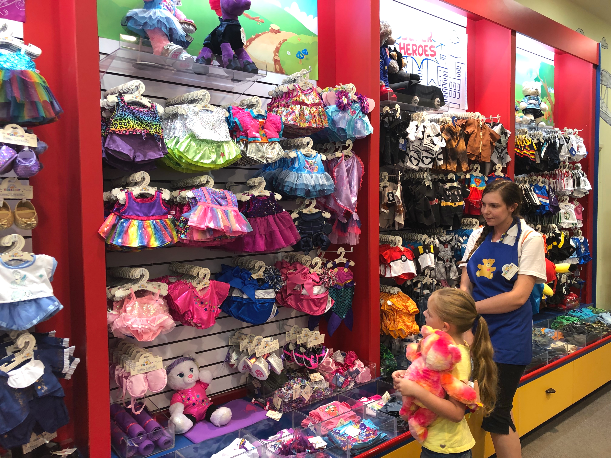 There’s endless options for dressing the bears including awesome licensed outfits like Shopkins, My Little Pony, NRL football team uniforms and more! I don’t know how the kids ever choose the right outfit but there is an outfit for every toy! You can also indulge in shoes and accessories including headbands, sunglasses, yoga mats, swimming goggles, footballs and more. When you’ve chosen all of your items there is a Dressing Room space to take your toy and get it dressed and check it out in the mirror. Of course once you’ve built your amazing bear, it’s time to name it and really bring it to life. Each bear gets its own birth certificate, and you can register a barcode that is inserted into the bear with contact details to avoid losing it too. It can be scanned at any Build A Bear store and returned to its owner. When you’re ready to take your bear home, you can choose between the very cool bear satchels where you can piggyback your bear home, or there is a cardboard box option shaped like a little bear house that the kids can colour in when they get home. Either way, walking out of Build A Bear – it’s impossible to do without a huge smile on the kids faces. What else can you do at Build A Bear? There are so many excellent experiences your family can have at Build A Bear Workshop. Here’s a few ideas that other tribes have done at Build A Bear. Click here to watch our visit to Build A Bear. Want to see some of the awesome ideas other tribes have had when visiting Build A Bear? Read on. This is a sponsored post for Build A Bear.